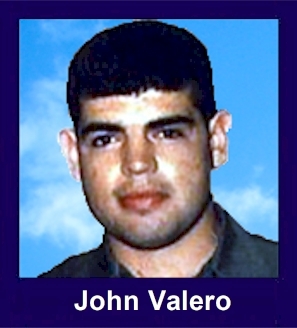 The 35th Infantry Regiment Association salutes our fallen brother, SGT John Juan Valero, who died in the service of his country on March 21st, 1969 in Pleiku Province, Vietnam. The cause of death was listed as Small Arms/AW. At the time of his death John was 21 years of age. He was from San Francisco, California. John is honored on the Vietnam Veterans Memorial at Panel 28W, Line 5. The decorations earned by SGT John Juan Valero include: the Combat Infantryman Badge, the Bronze Star with V, the Purple Heart, the National Defense Service Medal, the Vietnam Service Medal, the Vietnam Campaign Medal and the Vietnam Cross of Gallantry with Palm Unit Citation. John attended Balboa High School in San Francisco, graduating in 1965. He was a popular student and a standout athlete; playing baseball and football. He was quarterback of the football team and could throw a 60-yard pass. John attended San Francisco City College for one year. For heroism in connection with military operations against an armed hostile force in the Republic of Vietnam. Sergeant Valero distinguished himself while serving as a Squad Leader with A, 1/35th Infantry. On 21 March 1969 Company A was conducting a mission west of LZ English. As the platoon worked its way down the ridgeline, the point element reported movement in the dense underbrush directly to its front. Reacting immediately, Sergeant Valero moved forward to evaluate the situation. Noticing a numerically superior force of enemy soldiers in well entrenched positions, he deployed his platoon in a defensive perimeter. As his element came under intense enemy fire, Sergeant Valero moved from position to position to direct the fire of his own men. It was at this time that Sergeant Valero was fatally wounded by an enemy sniper. Sergeant Valeros personal bravery, outstanding performance and exemplary devotion to duty are in keeping with the highest traditions of the military service and reflect great credit upon himself, his unit, and the United States Army. Whenever football season rolls around, I think about the first time I met Green Bay Packers Coach Mike Holmgren. He extended his hand to me, and I tried to break his arm. That was in 1964, on Lincoln High's football field in San Francisco. Holmgren was an all-city quarterback for Lincoln, and I was an anonymous defensive tackle for rival Balboa High. Holmgren was rushing out of the pocket, and I had been allowed to slip past his center -- one of the few mistakes made by Lincoln's line that early October afternoon. Big Mike straight-armed me in the face, and I yanked the arm and quickly brought him to the ground. Then we exchanged shoves and nasty words. It was the third game of the 1964 season. Balboa and Lincoln each had won its first two games; Balboa had beaten the 1963 city champion, Washington High, 13? the week before. Lincoln, meanwhile, was a ten-point favorite with bookmakers on Mission Street, mostly because of Big Mike's leadership, a strong offensive line and two fast running backs. The opposing quarterbacks typified the two schools' cultural differences. Holmgren was big, tall and blond; Balboa's Juan Valero, the son of Mexican immigrants, was shorter, darker, wily and muscular. Valero, who was also Balboa's co-captain, was tough on the field but a supportive comrade in training and a warm friend. "Call me anytime, and I'll be there," he said when I first met him. "And call me John. That's my name in English!" While only a few miles separated Balboa and Lincoln, the schools were worlds apart. Lincoln had a fairly modern campus spread over several blocks in the outer Sunset District, named for its proximity to Ocean Beach. Balboa was built in the traditional Spanish style of architecture that dominated the Mission District in the decades after the 1906 earthquake and fire. Balboa drew students from the working-class south-central and southeastern sections of San Francisco. At that time Balboa was one of the biggest high schools west of Chicago. There were so many baby-boomer students that senior classes graduated in both June and January. In 1964 the Balboa football team got off to its best start since its championship season of 1957. In the opener we shut out Galileo 28?. We ran up 416 yards, while Galileo gained 139, most of them on rushes by a promising running back named O.J. Simpson. His thunderous charges left me with neck pains that still require weekly attention from a chiropractor. Valero had given me advance warning. "I grew up with Simpson on Potrero Hill," he said. "He'll run right over you if you don't move fast and hang on." After handling Galileo we beat Washington, but when we played Lincoln, it quickly became apparent that our team could not defend against Holmgren's powerful arm and eagle eye. At the half Lincoln led 13. In the locker room Valero tried to pump up our spirits while coach Archie Chagonjian and his assistant, George White, outlined second-half strategy. But when I scanned the faces of my teammates, all I could read was defeat. The bubble had burst. Holmgren and Lincoln were better, faster, stronger, smarter. When we returned to the field we'd have to fight for survival. Lincoln continued to score, and when Balboa got the ball, the scenario usually was run-run-pass-punt. Toward the middle of the third quarter, Valero handed off to halfback Milton Frank, and a blitz left them both on the ground. The overly exuberant Lincoln defenders made late hits and piled on. When one of the linebackers rose from the pile by stepping on Frank's hand. Two other Balboa backs, Victor Yanez and Leroy Caracter, protested. Several Lincoln linemen jumped them, and a free-for-all erupted. Both benches emptied. Players were swinging their fists, pushing and kicking. Holmgren shoved me, and I tagged him in the ribs. Some Balboa players grabbed a bench and charged into Lincoln players, stunning them. Lincoln's field, unfortunately, had seating on only one side, so spectators from both schools, seated near each other, began brawling, too. Several people were stabbed. Police tore through the stands, rousting troublemakers and arresting the most vicious of the attackers. The melee went on for at least twenty minutes and is still remembered as one of the worst high school riots in city history. At first we doubted that the game would continue, but after assurances from captains Valero and Holmgren, the teams ran back onto the field. There the football slaughter continued, and Lincoln won 51?, having racked up 460 yards in offense. Washington eventually won the 1964 city championship. Lincoln finished with a 7? record, and Balboa ended the season 4?, never having recovered from the beating by Lincoln. As the decades passed I never forgot Holmgren, as one never forgets anyone who ran over him in life. I often talk about that Lincoln-Balboa game when I see old high school friends, and we compare it to other events in our lives, seeking some kind of cosmic meaning. "Just one of those things," we eventually agree, believing that the real value of our athletic experience at Balboa was having learned teamwork. "What I've loved about playing football at Balboa," said Valero at a team meeting at the end of the 1964 season, "is that we have nearly forty different guys; black, white, Mexican, Irish, Italian, Filipino, Puerto Rican, even a Cajun, who work as a team and get along together. This is something that we can take with us all through life: Knowing how to work with and get along with all kinds of different people. That's what we've really learned on this team." I lost track of Holmgren after he and Simpson made the all-city prep team in 1964. While Simpson went on to win the Heisman Trophy at Southern Cal in 1968 and star in the NFL, Holmgren faded from memory. But I knew exactly what happened to my teammates. Valero, Frank, Yanez, Caracter and I went into the Army, as did many of our 1964 teammates. Most of us couldn't afford college, even if we had been able to get into one. There were no football scholarships for the Balboa team of 1964. Yanez and I were drafted on the same day in 1968 and went to basic training together at Fort Lewis, Wash. Yanez had become Balboa's quarterback in 1965 after top jayvee prospect Rodney Garcia was gunned down in a drive-by shooting a block away from campus. The killer randomly fired at a crowd of us eating lunch at a drive-in restaurant, killing Rodney, wounding another student and scattering the rest of us. The last time I saw Yanez, we were at the rifle range. "Well, Toland," he said, "I guess we're on a winning team this time." A year later, already a decorated infantry sergeant, Yanez died in a jungle in Vietnam. Holmgren, as it turned out, coached high school football until 1981. When he landed a spot as an assistant coach at San Francisco State, our paths crossed again. I had just been hired there as a part-time journalism lecturer. We talked for a few minutes one day near the football field, I told him that after my discharge from the Army, I had hitchhiked around the country, then worked my way through college. We were both a little envious of Simpson's success. I couldn't admit to Holmgren how lousy he had made me feel back in 1964. When Holmgren took Balboa apart that day, everyone on our team thought that he was just another high school kid and that we had been beaten badly by just another peer. It would have softened the blow quite a bit to have known that one day Holmgren would become head coach at Green Bay and eventually lead his team to victory in Super Bowl XXXI. When Brett Favre and the rest of Holmgren's crew sent New England packing last January, I couldn't help thinking of how Holmgren had cut his teeth on us in 1964. I watched last winter's Super Bowl with my 16-year-old son, John, and told him the story of Lincoln versus Balboa, Holmgren versus Valero. John asked me to dig out my old yearbook to see if there might be a photo of me chasing Big Mike or maybe even O.J. There wasn't. Instead, one photo on the varsity football pages caught my eye. It was the only one that had been signed. It was of number 10, John Valero, running with the ball against Sacred Heart High. He had written on it simply: "Remember Me!!" Valero, a decorated infantry sergeant, like Yanez, also was slain in Vietnam. If not for Holmgren, I might not have opened that dusty old yearbook, and I might not have passed Valero's legacy on to my son: "Move fast, hang on, and celebrate diversity." I recall meeting John soon after I returned to the company from base-camp where I was recovering from a minor wound in a conflict two weeks earlier. I remember that great smile. There he was, glad to make my acquaintance and just as cordial as could be. I guess one could say he was a handsome fellow and very pleasant. I found his demeanor telling as here he was put in a position of leadership and almost everyone else in his squad had been through the mill so-to-speak. And he handled it admirably. I'd have to say he was just a really nice kid. I most remember the night before his death. John, Ron 'Pig Pen' Alden and myself sat atop a hill within our platoon's night perimeter thinking about our lives back in the states. Which means, we mostly discussed our girlfriends. It was obvious that John loved his family and girlfriend. He loved life and wished to return to those he loved so much. We all three enjoyed that night and each others company reminiscing of the past, not knowing the turn of events that would impact this friendship the next morning. That morning, John's squad was to assume point and John chose to be pointman first. He also chose to carry the heavy Starlight scope, which was a duty passed among squad members regularly. That was the sort of person John was. We began the descent into a valley where eventually we came upon a newly made lean-to. The lieutenant ordered us to form a perimeter around the freshly cut habitat. Both John and I were out front terribly exposed. John had actually positioned himself on a trail that passed by the large tree where the lean-to sat. I remember looking over to John and I saw that the starlight scope cap had come loose. We had often been told to make sure that cap remains secure as not to damage the scope. I thought about it for a minute then again looked over to John with the intention of informing him that the cap had come loose when I saw him rise and alert the platoon of the danger ahead. We both then scrambled for cover as a fire-fight ensued. Unfortunately, John was fatally wounded before he could reach cover, but not before he alerted the platoon of the impending danger. I do think of John from time to time. It's often in the contex of the lunacy of combat. Why such genuine people like John must endure the savages of war? John, you were a class act. I salute you! I'm saddened to add that John's best friend, at the time, Ron 'Pig Pen' Alden, has just passed away (March/April 2000). We affectionately called him pig pen because of the facial scars that adorned his face incurred in a fire before Vietnam. These scars gave the impression of an unwashed appearance. Like John, Ron was one of the friendliest people you'd ever wish to meet. I'm lucky to have met and served with both men. John was my best friend at Ft. Benning Ga where we went through NCO school together. His unique personality, (in just those few months), created a bond that after all these years remains with me. Every time I think of those years the memory of John comes to mind first and foremost. We talked about things we were going to do together when we got out of the service that I live regretting will never be. His fond memory however will never be taken away. His parents who he was so proud of should know my son married a beautiful young lady who is half Mexican and I was given a grandson a couple years later. When I looked at him for the first time I thought of John and that this was life's way of giving him back to me. He's four years old now, my best friend and I have never turned down a minute of opportunity to be with him. One of these days when he is much older I intend to tell him about John Valero my other best friend. Even though the time I had with John was brief I cherish it and will remain forever grateful. John was the gentlest man I ever knew. He love his parents very much and talked about them often. He said his father offered to take him to Canada but he felt obligated to go to Vietnam. I miss you John. I was with Jerry Vanguard the day he found out about Johns death. I remember we went into a bar on West Portal and sat and talked about John and how young he was. The song Hey Jude came on the juke box and I will never be able to hear that song and not think about Jerry missing his dear friend John. John rest in peace brave soldier you are missed by all.